Nurturing the spiritual development of young children and those who teach and love them. Working directly with teachers, both at professional development conferences and through long-term engagements, my workshops inspire educators’ interactions with children, creativity within the classroom environment, and their own spiritual development. This workshop was designed for educators and directors as inspiration for beginning the school year. The lens focused on the integration of Reggio Emilia philosophy to Jewish early childhood education. Pittsburgh, PA (August, 2013) This workshop focused on an integration of nature, aesthetics and Judaism. Biosophical Society, Punderson State Park, Cleveland, OH (July, 2013). 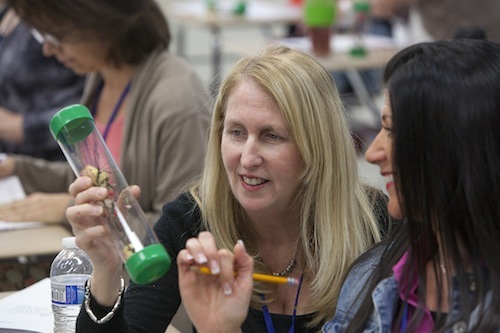 This workshop ended with teachers exploring and making their own Nattles™ (nature rattles) for their classrooms. Here we integrate Reggio Emilia philosophy with Jewish text, holidays, and values. An exploration of selections from a new book we are currently writing together, in which we discuss the gifts of Judaism – spirituality, growth, nature, learning, Jewish experiences – and the integration of holistic Judaism, including practical resources for educators and parents living in today’s digital world. See what people are saying about Deb’s workshops! Learn about Deb’s nature bottle-making workshops for adults, teachers, families, and children. Thank you for your wonderful presentation at the BJE event. I enjoyed listening to you and felt incredibly inspired by you. I too believe that as teachers we are facilitators and the moment we understand that, we open an entire realm of possibilities for our children. We are most appreciative of the contribution you made to the day, and the benefits that the students of those in attendance will derive from your teaching. Very interesting and refreshing to learn about the developmental growth of children from a spiritual point of view. Thank you! I am so glad that you will be the Jewish support person for the JCC. Your passion and expertise will be so inspiring for the staff and children. Deb is the first person I contact with any questions about how very young children learn concepts. Her in-depth knowledge and experience is always a source of guidance for me and my work in science education. Such a great lecture! It’s so nice at the beginning of the year to recenter oneself on the basics of the relationship between child and teacher. I am 9 weeks away from finishing my music therapy internship. I still have the nature items I collected at that Shabbaton on my dresser – your workshop was so inspiring in helping me decide to go forward with this [career]. Music therapy is a good fit for me and I hope you are finding your work similarly rewarding. I want to thank you for sharing your very special wisdom and life experiences with our staff. Everyone enjoyed it tremendously. I look forward to more collaborations. We loved Deb Schein! Her sessions were well organized; she knows her subject deeply and facilitated a cross-cultural environment that encouraged everyone to learn and feel capable to implement their learning in the classroom.